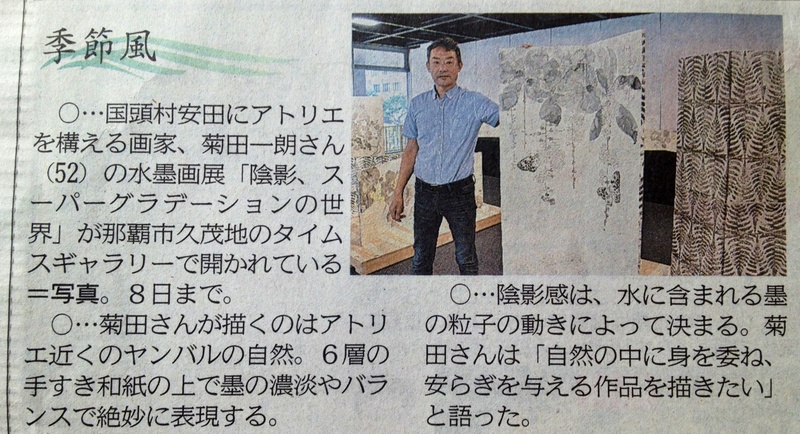 Ichiro Kikuta creates amazingly livid impressions of objects of nature using only oe color. 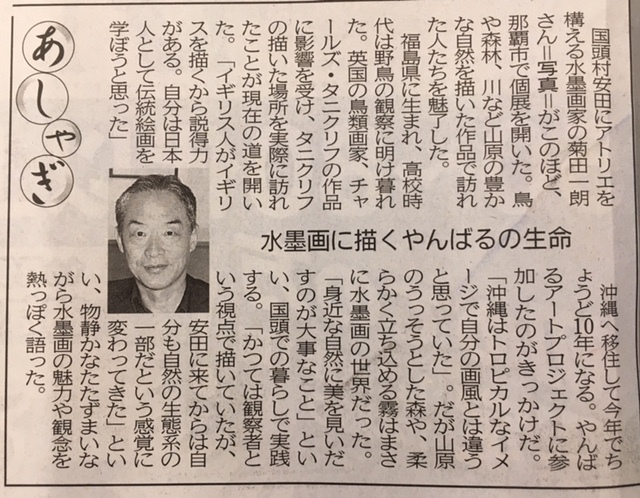 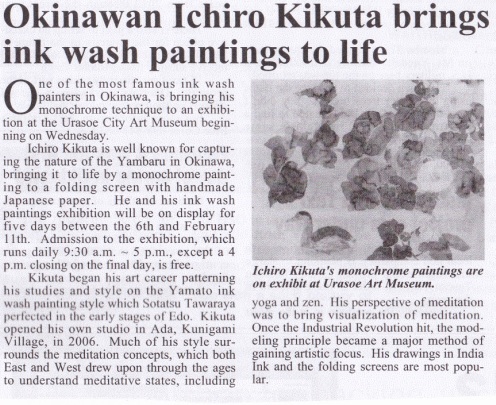 Ichiro Kikuta is one of the most famous painters in Okinawa, known for his talents with ink wash and the ability to create brilliant images with a single color. 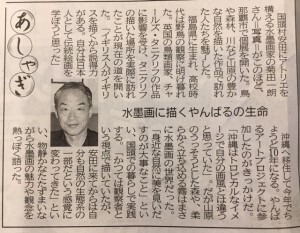 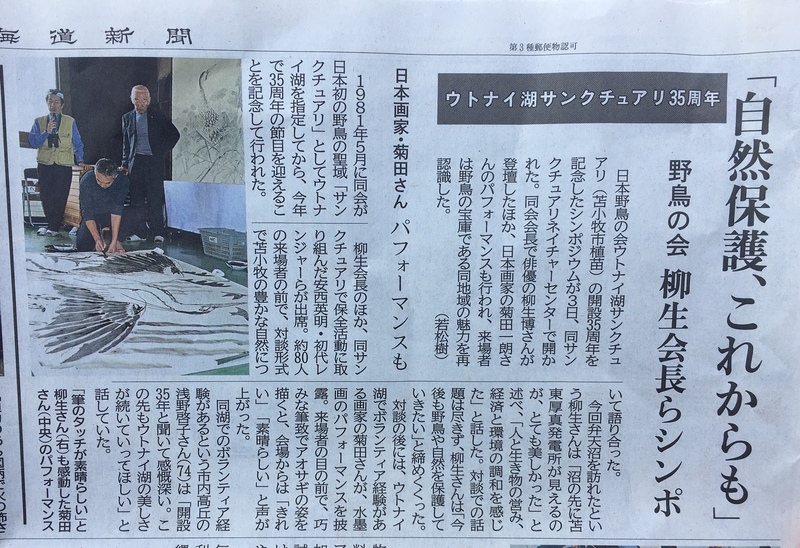 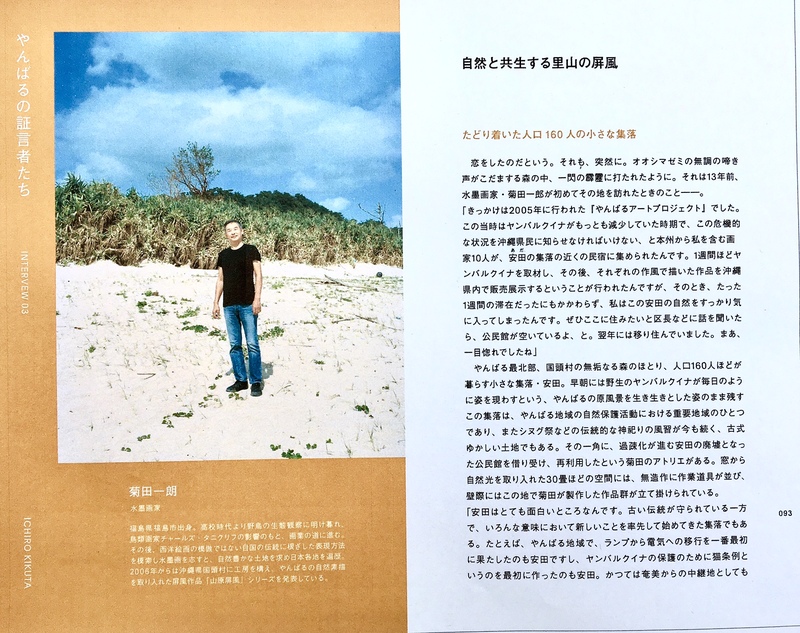 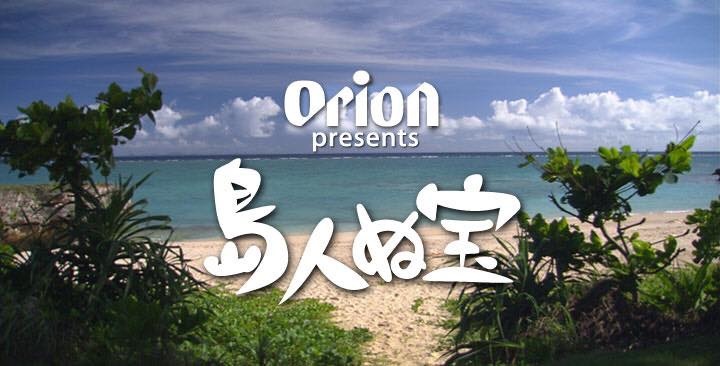 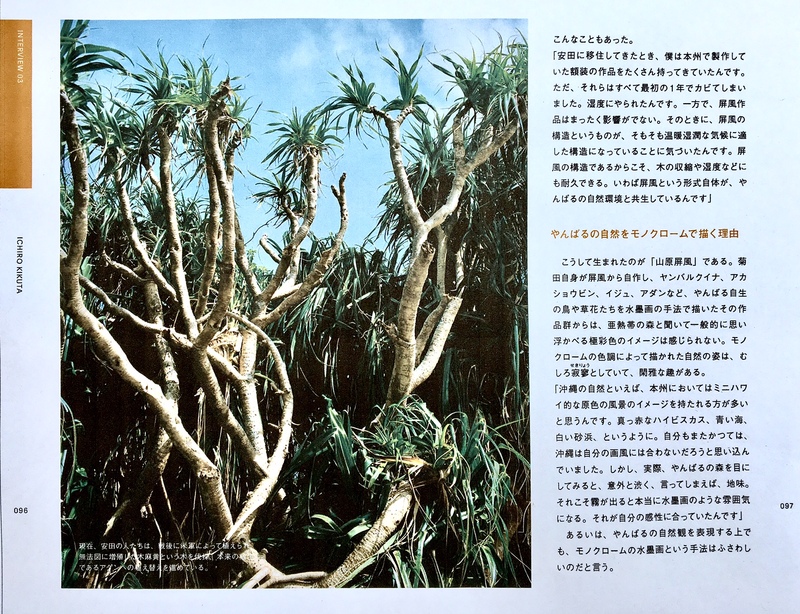 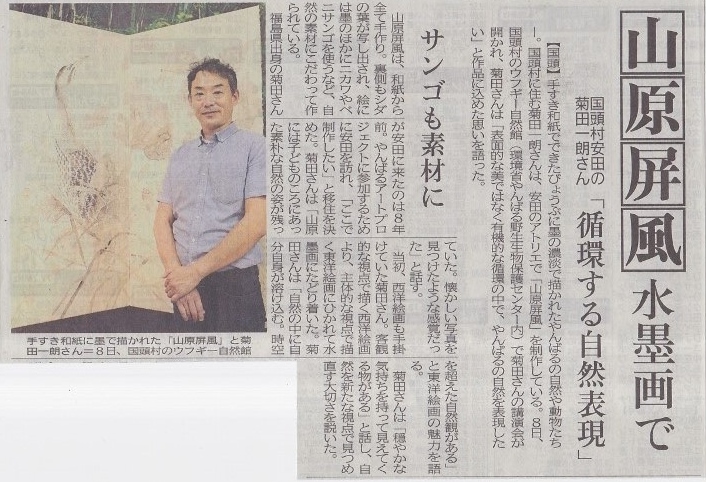 Over the past several years he’s conducted exhibitions around the island, including at the Okinawa Institute of Science and Technology, at commercial department stores, and at the cultural ‘Nakamura House’, but this weekend he’s going a new direction. 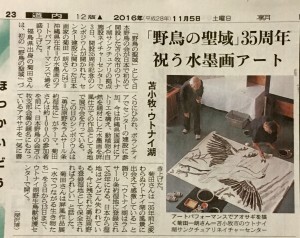 He’s taking his works Saturday evening to Ada Elementary School, surrounded by rich nature and to be close to where he lives. 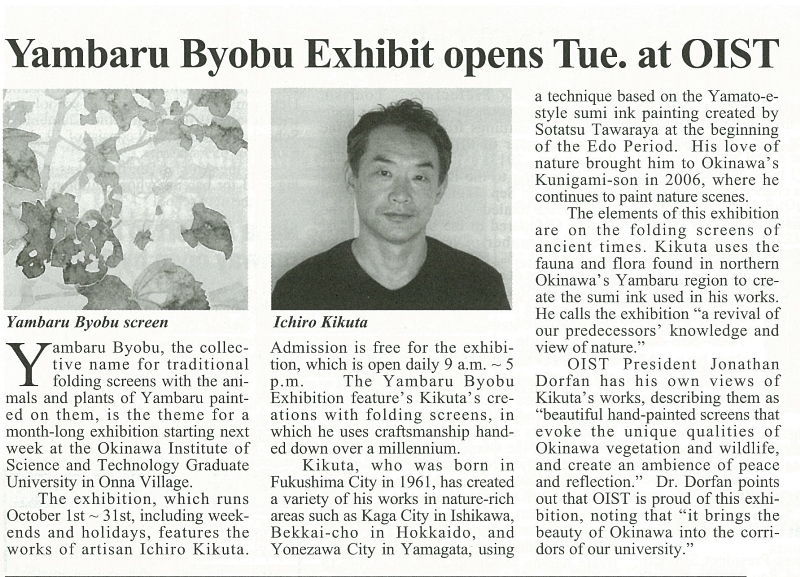 Admission is free to the program at the school, 279 Ada, Kunigami Village, starting at 6 p.m. 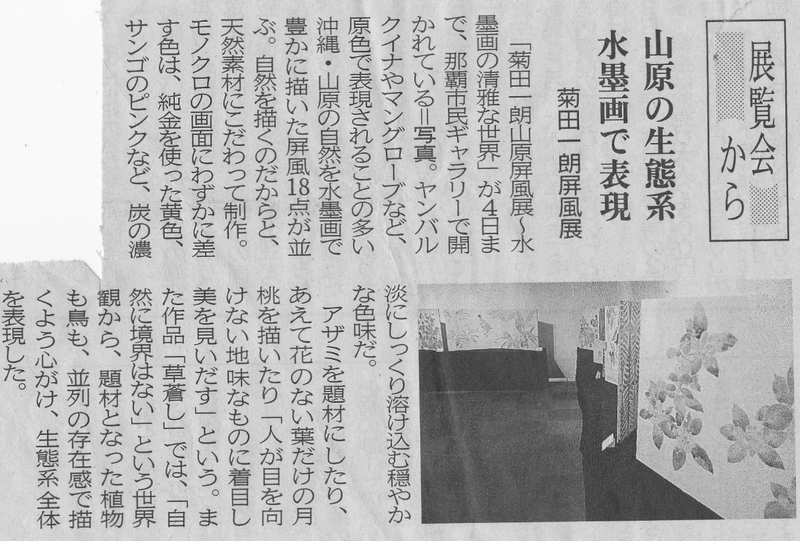 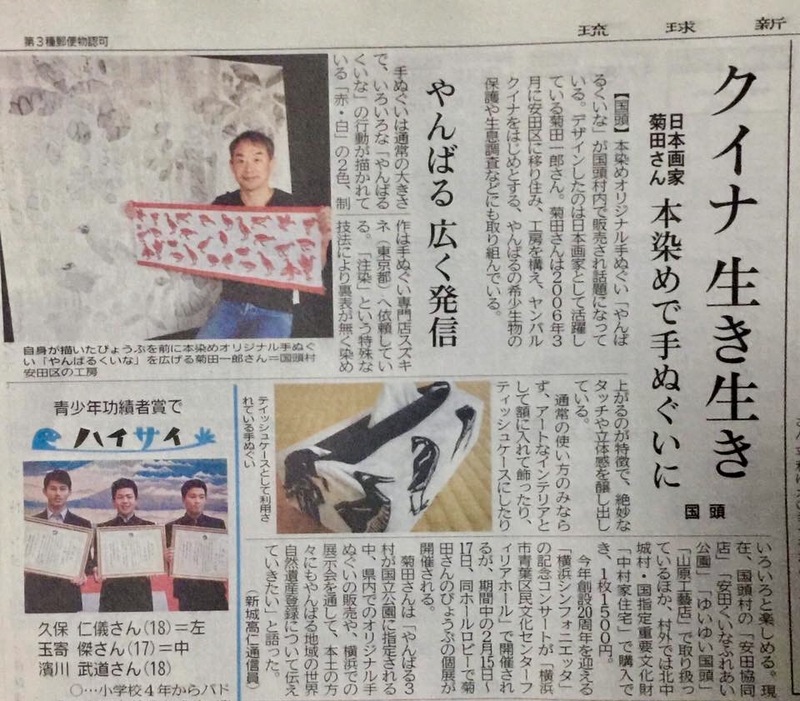 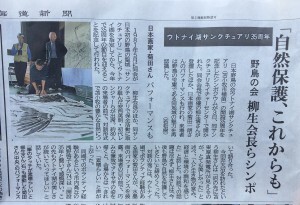 The live event will combine Kikuta’s painting with music and dance performances to create an audio-visual synergy. 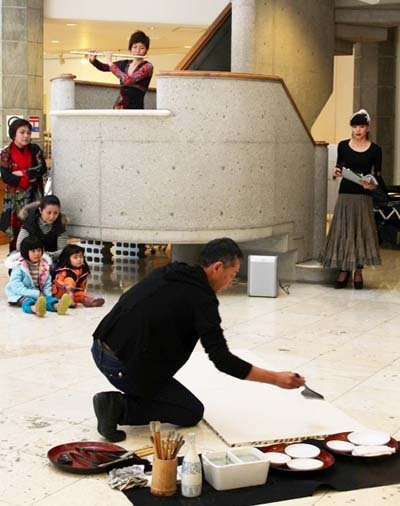 Kikuta will create paintings live in front of the audience, assisted by Wong Chika, while jazz flute player Yukari presents flute music. 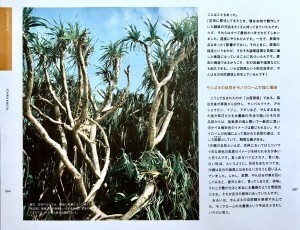 Kikuta calls the evening as the nature of Yanbaru. 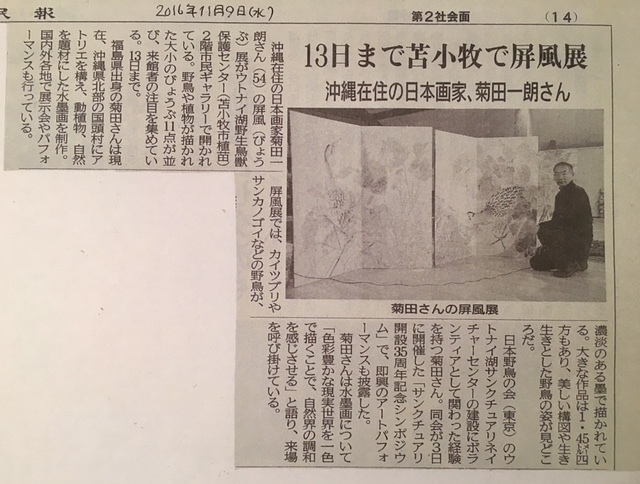 The two painters will create two huge paintings 1.5 meters wide and 18 meters in length. 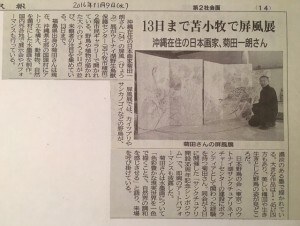 Also on the program is another performer, Kimiko, who will dance. 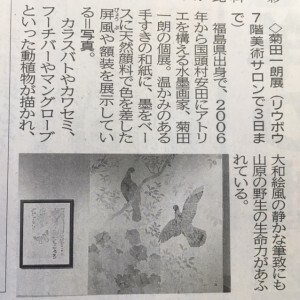 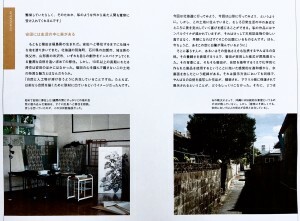 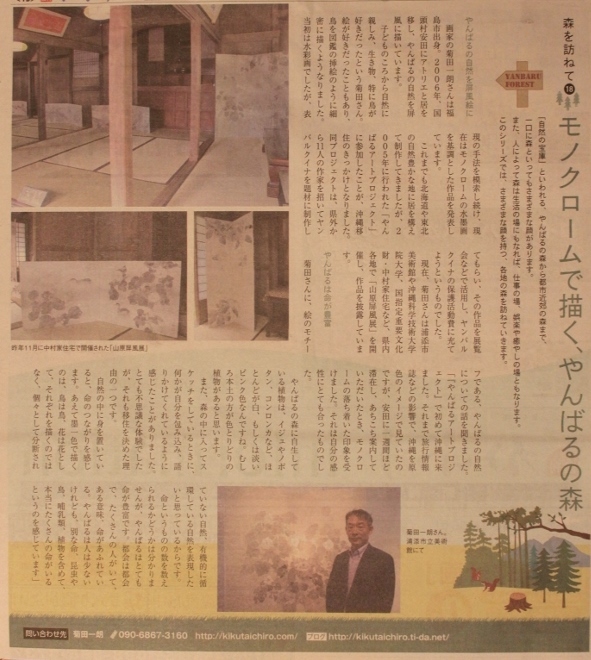 The professional painter says he wants people to attend and feel the atmosphere, particularly the essence of Yanbaru, during this green season. 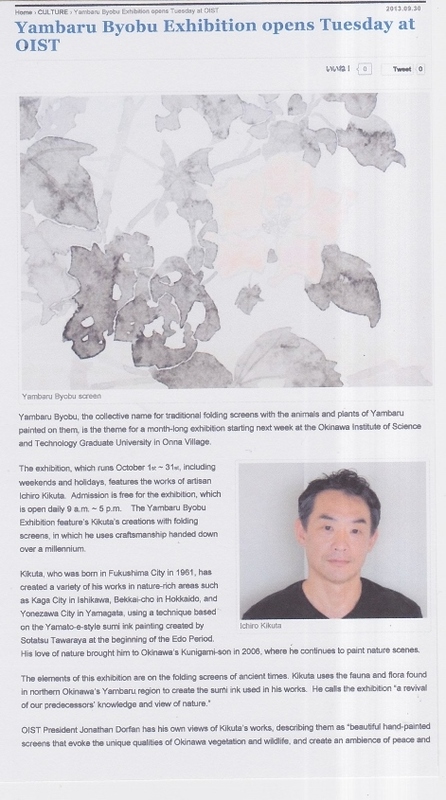 Kikuta began his art career studying the Yamato ink wash painting style by Sotatsu Tawaraya of the early Edo era. 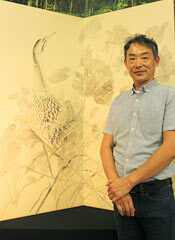 He opened his own studio in Ada in 2006, wrapping his styles around meditation concepts. He’s a believer in understanding meditative states, including yoga and zen, and the perspective visualizing meditation. 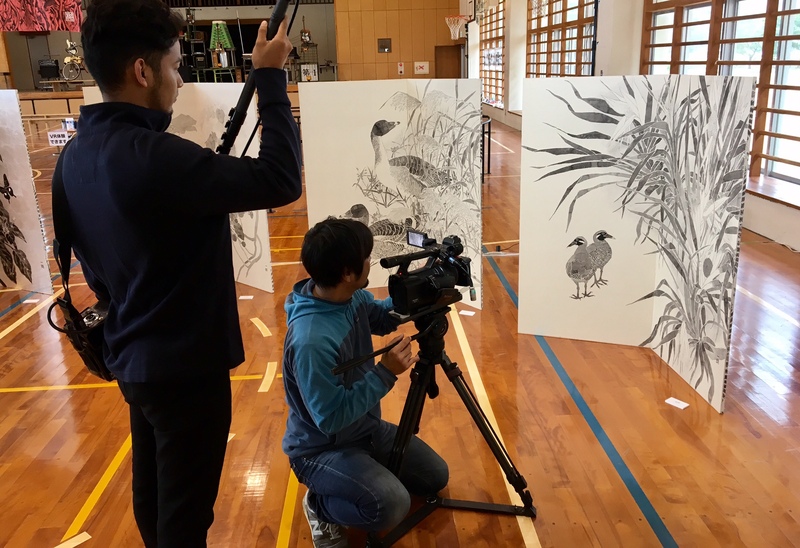 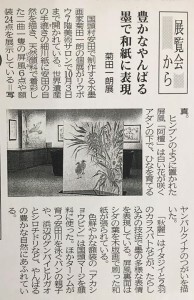 Yambaru Byobu, the collective name for traditional folding screens with the animals and plants of Yambaru painted on them, is the theme for a month-long exhibition starting next week at the Okinawa Institute of Science and Technology Graduate University in Onna Village. 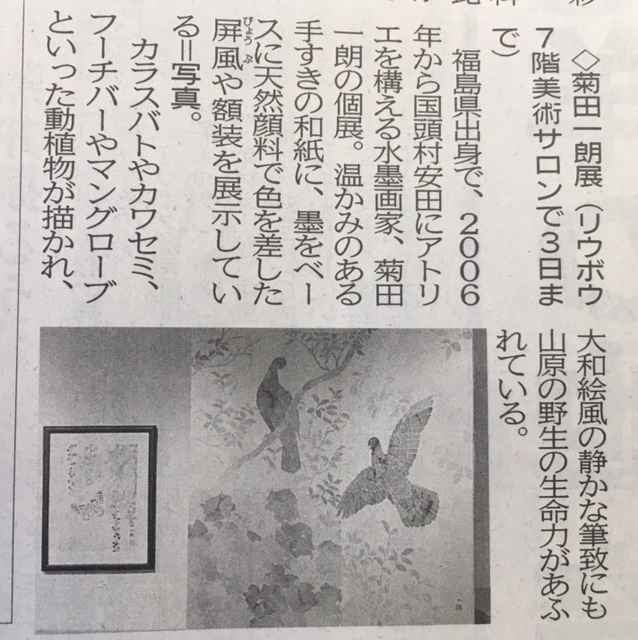 The exhibition, which runs October 1st ~ 31st, including weekends and holidays, features the works of artisan Ichiro Kikuta. 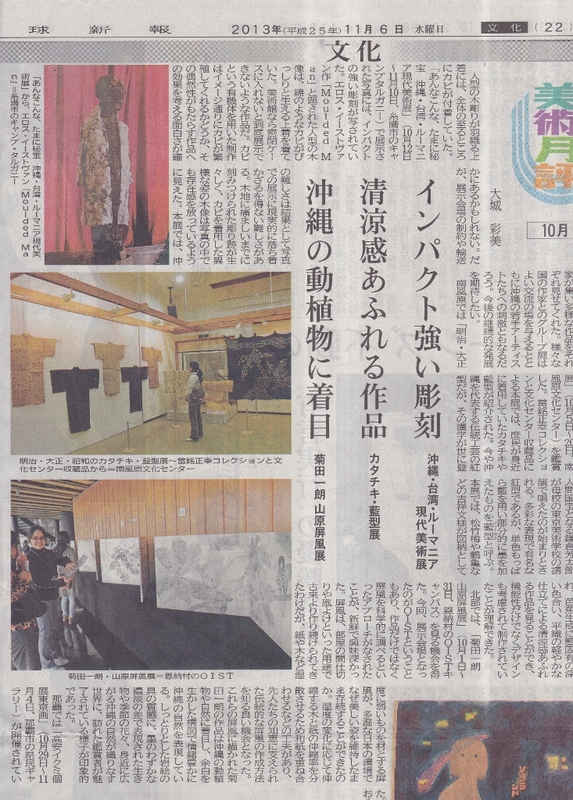 Admission is free for the exhibition, which is open daily 9 a.m. ~ 5 p.m. The Yambaru Byobu Exhibition feature’s Kikuta’s creations with folding screens, in which he uses craftsmanship handed down over a millennium. 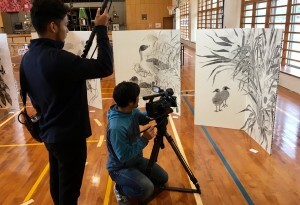 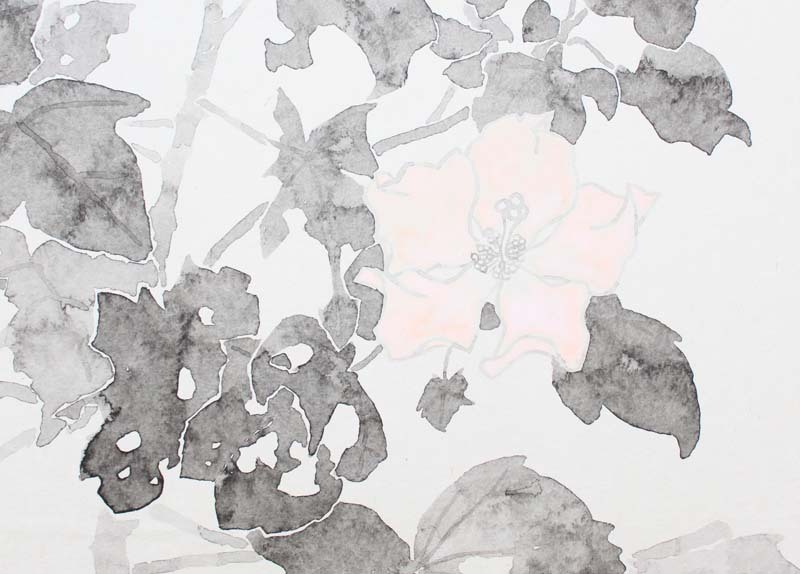 Kikuta, who was born in Fukushima City in 1961, has created a variety of his works in nature-rich areas such as Kaga City in Ishikawa, Bekkai-cho in Hokkaido, and Yonezawa City in Yamagata, using a technique based on the Yamato-e-style sumi ink painting created by Sotatsu Tawaraya at the beginning of the Edo Period. 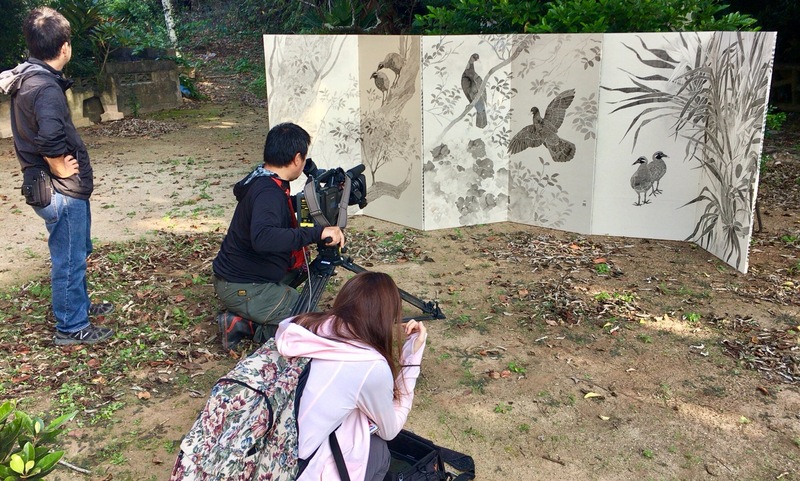 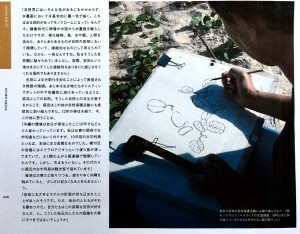 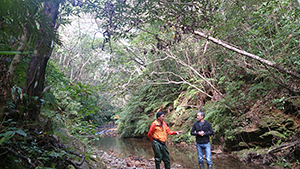 His love of nature brought him to Okinawa’s Kunigami-son in 2006, where he continues to paint nature scenes.